Have your taste buds grown up yet? Maybe one day they will! What an interesting foodie household we have had here in the past few weeks. Kirina is almost three and Ela is almost 3 months. Kirina, my original “ethnic baby” (aka guinea pig for recipes from my please-let-me-get-published-soon-book) is in toddler-eating mode and Ela is in full-on nursing mode (forming her own tastes through breast milk based on what I eat). Mommy and daddy eat when we remember to, often late-night suppers once Kirina is in bed and Ela snoozes in my lap. The main dinner table drama these days involves dear Kirina, who, as a toddler, has her own will, her own wants and her own tastes. Which would be fine, except her tastes involve graham crackers with cream cheese, grapes, and hummus with strawberries….over and over and over and over and over….and over again. Coming from someone who craves variety on a daily basis, I just don’t understand how this little munchkin of mine can have such a boring (to me) diet. She used to love variety, but has now settled into a sort of cracker and dip complacency. Which is why I keep introducing new tastes, just so we keep up the habit. 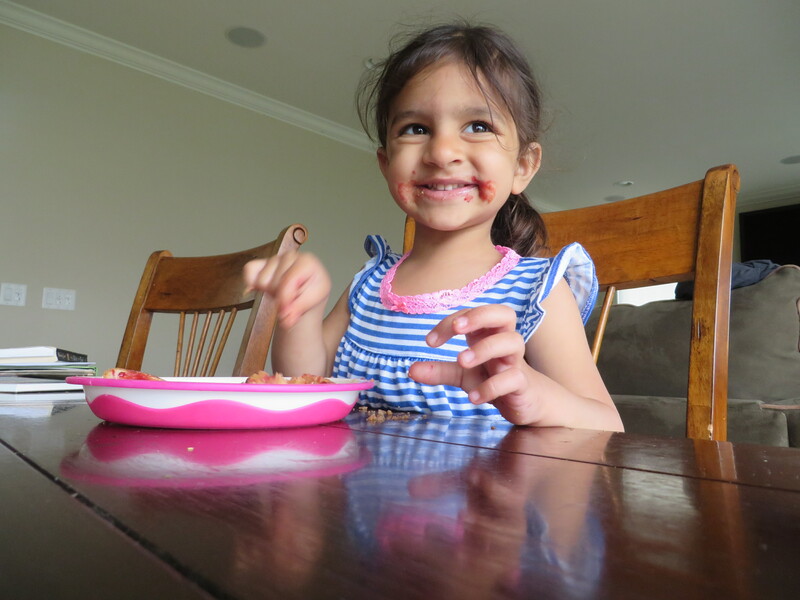 The other day we were eating an eggplant and potato curry, two vegetables that she hasn’t warmed up to (yes, she is the only child on the planet that does not like potatoes. she will not take them mashed, she will not take them fried, she will not take them baked, broiled or otherwise, Sam I Am). The vegetables were cooked in an onion, tomato and yogurt gravy and sautéed with spices such as cumin, coriander and garam masala. She took a small spoonful and made a face. Not a happy one at that. Oh my goodness, this sentence was great! She started asking us if taste buds grow like hair (hair?) and we told her yes indeed, taste buds grow like everything else! And truly they do. Imagining taste buds like any other organ in the body helps to understand…they, like other body parts, need time and nurturing to mature and grow. Only with taste buds they grow to appreciate new tastes and flavors. We have used this sentence with Kirina for all sorts of things she doesn’t have a taste for yet–olives, squash, eggplant. And the key is not giving up. I always ask Kirina to taste everything, especially if it is a new ingredient, usually telling her she doesn’t have to like it, but she at least has to try it. Now with this new bit of advice about her taste buds growing up, she really does try harder to taste new things. She’s excited by the concept of things growing and this helps her relate to new things instead of just shutting down the idea, as many toddlers are prone to do. Motherhood is SUCH a day-by-day learning experience. I never fully feel like I know what I’m doing or if I am doing it right (no matter the topic). Little nuggets of advice from other mommies surely helps lead the way. « Have an ear? Make it spicy! Hi Runa, thanks!! Sooo nice to hear from you! Ela Rania Saini was born on March 7th. She’s almost 3 months now! Kirina has taken some time to adjust, but she is getting there. I hope they are close friends one day and, like you and Nina, have each other to lean on always. Omg, two is tough! How do you do it?! Love Renee’s and JD’s go to foods! Kirina is obsessed with hummus! Fruit too…no matter the day. She also (strangely) wants to chew on jeera seeds all the time. Lol. Ha! And Kirina is bean pole too. She could eat muffins all day long and still not gain an ounce! Jealous. Wonder if Ela will be the same…she was born 5lbs.